« 2019 Spring Meeting Registration is Now Open! 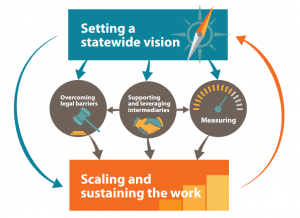 Perkins V: How can states expand work-based learning? This new bi-monthly blog series will highlight key Perkins V questions and topics and link them to relevant Advance CTE reports, guides and policy profiles featuring research, promising practices and examples of state policies. Work-based learning is an increasingly popular strategy for learners to reinforce and deepen their classroom learning, explore future career fields and demonstrate their skills in an authentic setting. In addition, the Strengthening Career and Technical Education for the 21st Century Act (Perkins V) features a formal definition of work-based learning and references it throughout the law, including in the state plan and local application sections. Perki ns V also includes participation in work-based learning as one option for states as they select their accountability indicators. As states set their vision for Career Technical Education (CTE) and develop Perkins V plans that expand access to high-quality CTE programs of study, how can they increase access to work-based learning opportunities, chart a new course or scale efforts already underway? Check out the resources below to learn more. GUIDE: Connecting the Classroom to Careers: A Comprehensive Guide to the State’s Role in Work-based Learning: This guide provides key considerations and guiding questions to walk states through the steps of building and scaling a high-quality work-based learning system, drawing on state examples to highlight innovative solutions to common challenges. REPORT: Opportunities for Connecting Secondary Career and Technical Education Students and Apprenticeship Programs: This report profiles eight secondary apprenticeship programs to identify strategies to connect CTE with apprenticeship program and outlines key takeaways and recommendations for program design, program effectiveness, student-parent engagement and communications, financing, and equity and access. Watch a related webinar here. GUIDE: CTE on the Frontier: Connecting Rural Learners with the World of Work: This brief on rural CTE access and quality, explores how states have identified ways to bring the physical experience of work-based learning and employer engagement directly to learners through simulated workplace experiences, innovative satellite campuses and mobile labs. University of Pittsburgh’s university-wide program, Outside the Classroom Curriculum, aims to equip students with employability skills necessary for a successful career. The next blog in this series will include accountability resources and in the meantime, please be sure to check out the Learning that Works Resource Center. This entry was posted on Thursday, January 17th, 2019 at 2:14 pm	and is filed under Uncategorized. You can follow any responses to this entry through the RSS 2.0 feed. Both comments and pings are currently closed.